Tomorrow is the second and final ‘blood moon’ expected this year. NASA – On Wednesday morning, Oct. 8th, not long before sunrise, the bright full Moon over North America will turn a lovely shade of celestial red. It’s a lunar eclipse—visible from all parts of the USA. “It promises to be a stunning sight, even from the most light polluted cities,” says NASA’s longtime eclipse expert Fred Espenak. From the east coast of North America, totality begins at 6:25 am EDT. The Moon will be hanging low over the western horizon, probably swollen by the famous Moon illusion into a seemingly-giant red orb, briefly visible before daybreak. West-coast observers are even better positioned. The Moon will be high in the sky as totality slowly plays out between 3:25 am and 4:24 am PDT. During a lunar eclipse, the Moon passes deep inside the shadow of our planet, a location that bathes the the face of the Moon in a coppery light. Espenak notes that “the total lunar eclipse of Oct. 8 is the second of four consecutive total lunar eclipses. Such a set of total eclipses is known as a tetrad.” The next eclipse in the tetrad is six months from now, in April 2015. 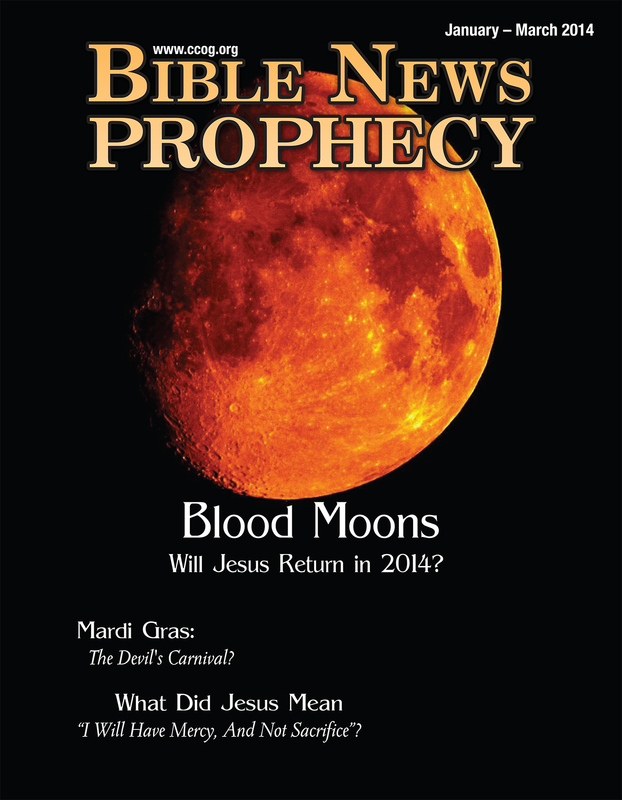 Protestant ministers John Hagee and Mark Biltz have suggested 2014 as a possible date for Jesus return and that this could be tied to a blood moon. While we are in the last days, and probably in the time that Jesus referred to as the beginning of sorrows (Matthew 24:4-8), there is no possible way that Jesus will return in 2014. Actually, I do not believe it is biblically possible that Jesus will return before 2021. Because too many events, including some with specific time periods associated with them have not yet began. For one, the ‘peace deal’ of Daniel 9:27 has not yet been confirmed for seven years (a prophetic week), and Jesus does not return until seven years after that deal is confirmed. The above events have not yet returned. And since that tribulation cannot start for at over 3 1/2 years from now, then there are another 3 1/2 years, etc., this means that Jesus will not return before 2021. A Messianic Jewish Rabbi named Jonathan Cahn was interviewed by Pat Robertson on CBN on 02/05/2013). Jonathan Cahn is probably most well know for a novel he wrote called The Harbinger. 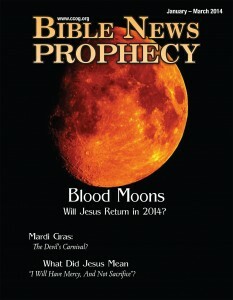 He has since wrote other books and has indicated potential prophetic importance of blood moons in 2015. Now if by tribulation, Jonathan Cahn meant the Great Tribulation, then it is not at all possible to begin then. I have gone over this before in various articles and videos, and I have directly debunked the hypotheses of the Great Tribulation beginning in 2014 or 2015 (see When Will the Great Tribulation Begin? 2014, 2015, or 2016?). On the other hand, if the seven-year deal of Daniel 9:27 is confirmed then (see also The ‘Peace Deal’ of Daniel 9:27), then the seven-year period some Protestants call the ‘tribulation,’ with the “Great Tribulation” starting 3 1/2 years later, it is possible September 2015. Jesus is coming, but Protestants and others who overlook certain scriptures will tend not to know when. It is from the Bible that we in the Continuing Church of God can “We have also a more sure word of prophecy; whereunto ye do well that ye take heed” (2 Peter 1:19, KJV). This entry was posted on Tuesday, October 7th, 2014 at 7:00 am	and is filed under Prophecy.